I realize that some of you may think it is a little early for Easter table decor but look how long we leave our homes decorated for Halloween, Thanksgiving and Christmas. 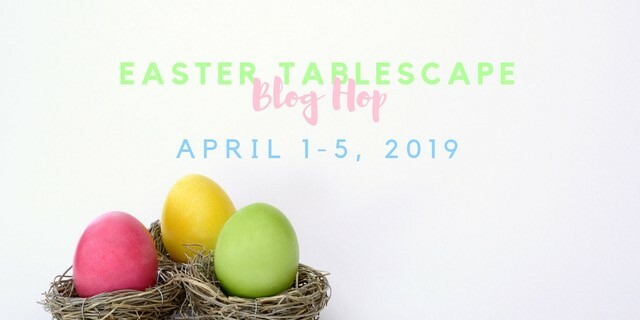 Since I think Easter deserves a little bit longer than a week or two, I happily jumped at the chance to participate in the Easter Tablescape Blog Hop hosted by Chloe at Celebrate and Decorate! If you are joining me from Zucchini Sisters, welcome! If you are a returning visitor, welcome back! I hope you have enjoyed the tour this week...so many beautiful tables and so much inspiration! 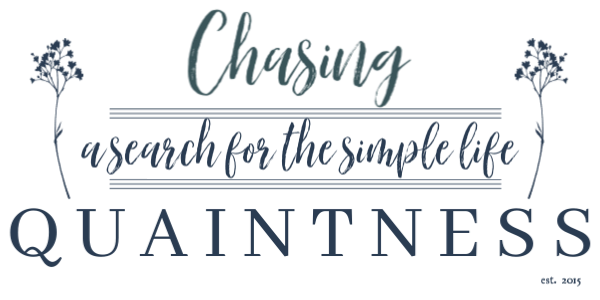 If you visited during the last tablescape blog tour, you know that I am not a traditional theme table decorator for the holidays (boy, that's a mouthful). 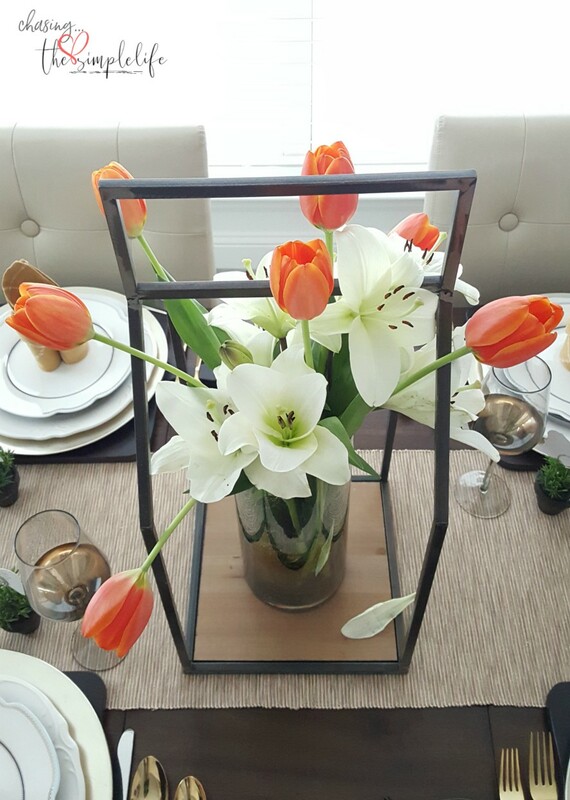 My spring table was not what you would expect, I mean, who uses orange and black for spring??!! While my Easter table is a little more inline with traditional Easter decor, it is not by much. I deconstructed my Easter centerpiece from the Pinterest Challenge and used the sweet bunny as the centerpiece for my table. I left the open lantern because it gives height. I also pulled the gold eggs from that same centerpiece to tie in with my flatware and stemware. The gold-rimmed salad plates were a great find at HomeGoods and were placed on top of the black plates. Since the gold-rimmed plates were clear, I thought the black would give them depth. My cordial glasses were the perfect size for holding iridescent pastel-colored eggs. The small amount of faux moss lends some texture and the striped napkin adds contrast. The napkin is folded in the only decorative napkin fold I know how to do. :-) I really need to step up my game and learn some new napkin-folding techniques. The Easter bunny napkin rings I had considered using were way too casual with the gold accents. The purple flowers give a bold pop of color (even though they are a soft lavender) to the table. 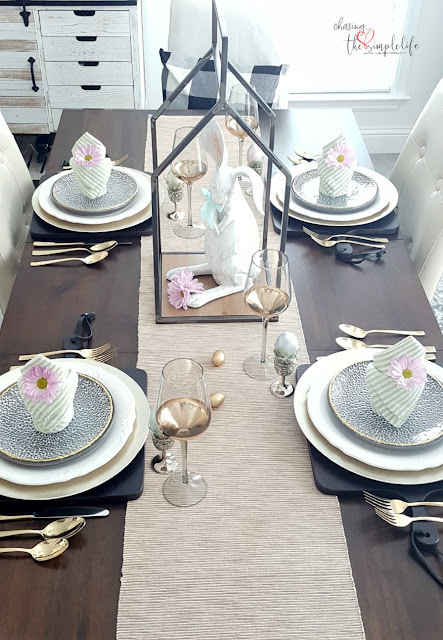 I hope you will continue the blog tour and find Easter inspiration for your table...you can click on the links below to follow along or backtrack to all the table decor from earlier this week. These ladies are so creative...there is something in every color for every decor style! You won't be disappointed! Everything looks so pretty! I love Easter. I will be going out shopping this weekend and hope to grab a few decorations. Im behind this year. Thank you so much! I was behind as well but joining the blog hop forced me to get on the ball! :-) Sometimes, I just need a push! LOL Hugs! That's a very fresh look for spring and Easter, Benita. Love the soft green striped napkins and the new plates. They look like rain puddles on blacktop, so typical of spring! Thank you so much Rita. I'm still missing those orange tulips but fell in love with the purple and green also...LOL Thankfully, we have lots of rain puddles right now. We've been without rain for about a month, so the rainstorm this weekend was very welcome! Love and hugs! Hope packing is going well! Love the table! You are one up on me on napkin folding lol. Thank you so much Penny! I need to practice more…this is the only one I know and I struggle with it! 😊 Hugs! 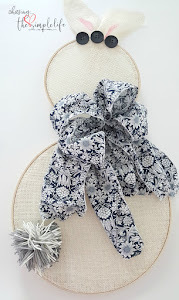 So pretty and simple and easy to do Benita. I love your bunny in a "cage" and the pale purple flower is just the right touch of color along with your gold accents. I must have missed those gold rimmed salad plates while at HG and your placement over black plates was genius. 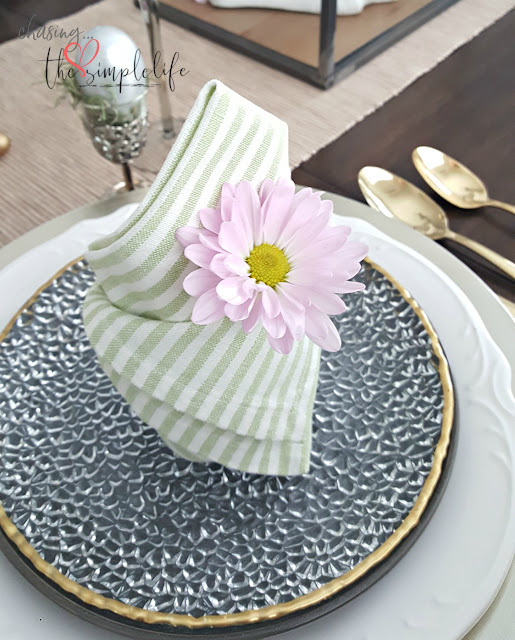 I'm still learning new ways of folding napkins...I made rose shaped napkins once but would have to go back to that post to see how I did it as my memory is about as long as the short end of a stick. Hugs sweet friend...you did good! Thank you so much Kari. I think each HomeGoods store has something different. I have two within 15 minutes of me and they each have different things...some the same but quite a lot of items that are different. I put the plates on top of the white plates and the little droplets didn't show up at all, but on the black ones, they popped. Thank you again! LOL...I'm right there with you. I had forgotten in just a couple of weeks! Have a great weekend! Love and hugs! Very pretty! I love the open lantern too. Thank you so much Stacey! That lantern has become my favorite piece on the table. It will probably be there from now on. 😊 Love and hugs! Well YES...I am in love with your table and that adorable bunny in the middle of the table in the lantern! It is all so adorable. I love the simplicity and yet stunning look and feel of this table. Hugs and blessings to you. Thank you Cindy! For some reason, once I pulled off the Christmas decor, which was a little busy, I seem to be leaning more towards clean lines and "less stuff" for the table. It is definitely easier when I need to set it for dinner to not have to move all of the things! :-) Love and hugs! A fresh, modern take on Easter. I especially like how you kept the stunning centerpiece simple, letting th rabbit figure steal the show. Thank you so much Debbee! I just keep choosing clean lines and can’t seem to pull away from them. Sure does make decorating a table easier for me and fewer things to remove when we need to eat dinner. 😊 Hugs! Love the simple and pretty. I like that the bunny is the star of the centerpiece. Happy Thursday my friend. Thank you so much Kris! He's a sweetie...you may be seeing him in July holding a flag for 4th of July decor! :-) Hope you are having a great weekend! Love and hugs! What a lovely Easter tablescape! Your use of lavender color flowers tucked in the napkins and sparsely around the bunny reminds me so much of my excitement to see the first color or sign of a Spring tulip at Easter. That first little flower can cause such a rush of emotion. This is how I feel when I see your beautiful table. I love the clean lines and modern feel to your table along with the neutral colors. The use of gold flatware and stemware adds such elegance and with the surprise of color, it really makes me feel like Spring/Easter is finally here! So beautiful. Happy Easter! Thank you so much! The clean lines seem to be my theme for table décor this year as I can’t seem to add to it like I did for Christmas. Once I get a couple of things on the table, it says “we’re done”…LOL I fell in love with the purple flowers when I saw them and knew they would go perfectly as a “pop of color” on the table. By keeping everything else toned down and neutral, they really stand out. Thank you again so much! Happy Easter to you! Hugs! I love the dark plate under the clear one it adds so much depth and texture. As others have stated, your tall bunny is a showstopper and the contemporary feel is very refreshing. Have a wonderful Easter! Thank you so much Sandra! 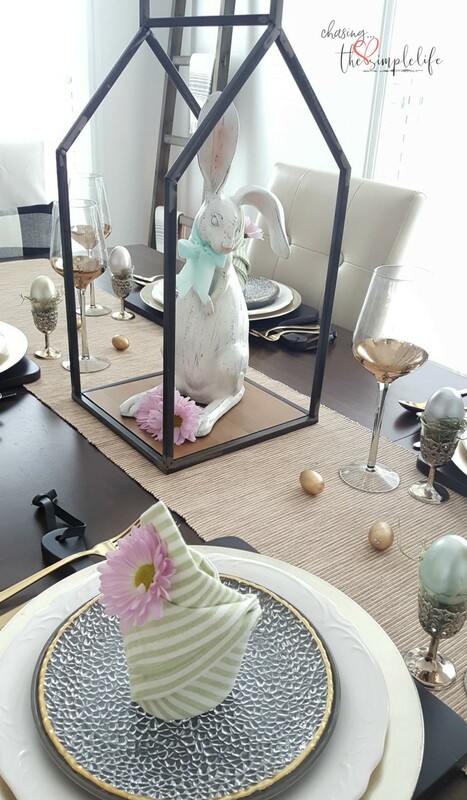 Since I don't have a lot of items to use on the table for Easter, I figured going with some pop of color, using that sweet bunny as the centerpiece and adding plates with texture would help build it up a bit! Thank you again! Happy Easter! Hugs! What unusual plates. And that bunny is adorable! Thank you so much Brenda. The bunny is from Hobby Lobby…they have several different sizes and they are all adorable! Love and hugs! Well, that is just lovely. I recently found my mom's old gold flatware and used it for the holidays. It looked so pretty, I'm going to use it more often. I love seeing it on your table. Thank you so much! Awww, that is awesome! I love the gold flatware...it just adds a little something elegant and extra to an ordinary table! Love and hugs! This is such an elegant table, Benita, but very crisp and clean too. 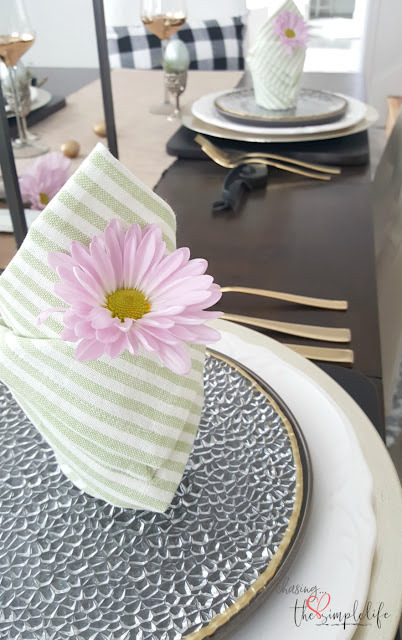 I love the colors you've used and those pretty green and white striped napkins. I'm such a collector of napkins and I just got through doing my big drawer of napkins folded the Marie Kondo way. Now I can see every color I have. Next I have 3 drawers of placemats and runners, etc. to fold. Not sure how that's going to work. I love the blog encouragements to enjoy a holiday table as long as possible! Btw, your William Powell is certainly welcome at my table and I added William Holden too! Thank you so much! I like the cleans lines also and will probably stick with them for the table. I recently did a purge with my napkins. I had so many sets and didn’t use half of them, so out they went. Hopefully someone else is able to make good use of them. I stick to the same color palette most of the time, so I can easily change out the neutral colors that I kept. Thank you so much for allowing W. Powell and I will definitely take W. Holden as well….YUM!! 😉 Love and hugs to you sweet friend!! This is stunning Benita! 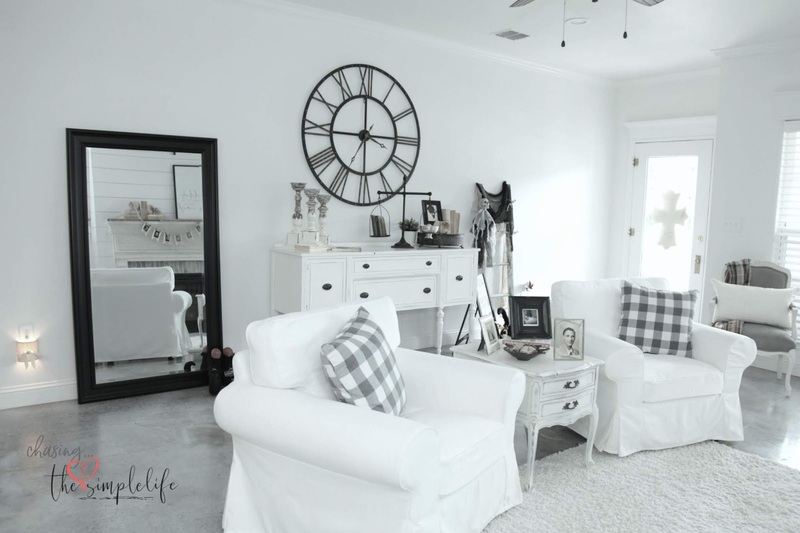 I love the clean modern look that is your signature style! How brilliant to set the gold rimmed plate on top of the same sized black plate, very dramatic and the perfect way to tie in the black of your lantern. Love the gold accents and the eggs in the cordial glasses...so beautiful and serene! Thank you so much Jenna! I am really enjoying the clean lines for the table and will probably continue it through the remainder of the year. I tried the clear plats on top of the white and they just got lost. The black plates underneath really do help the "rain bubble texture" shine through! Thank you again! Hugs! Benita, love that great big bunny in your centerpiece. Love the take on modern Easter decor. Gold eggs! That's a winner. Looks like a grown~up table for Easter. Thank you so much Carol! That bunny may just be finding his way all through the house this year! Who knows where he will pop up next. :-) Thank you...I'm loving gold touches in my decor this year, can't seem to get away from them. Have a great one! Hugs! Thank you so much Cecilia! Those lavender flowers add such a pop to my very neutral table. Have a great one! Hugs! Benita, I love your big bunny in the lantern as your centerpiece. The touches of gold lend a sophistication to your lovely table! It is a pleasure to hop with you and Happy Easter! Pam, thank you so much! 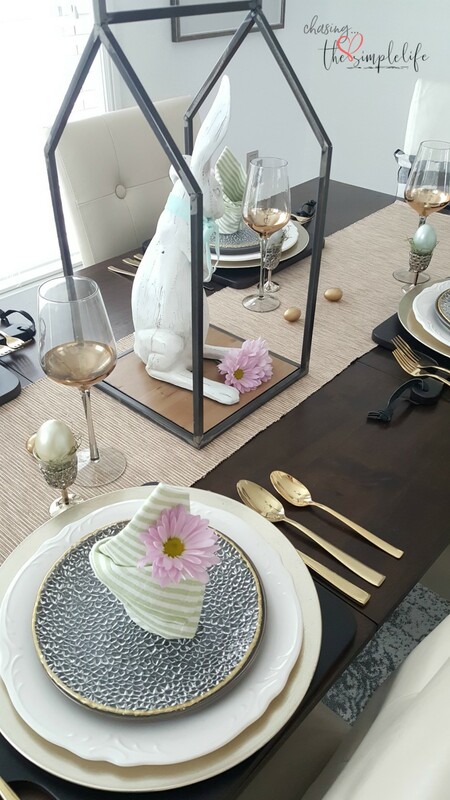 That bunny is just the sweetest and has been great to use in my spring/Easter table decor. I've enjoyed the hop every much! Thank you again! Happy Easter to you! Hugs! Thank you so much Katherine! I love the purple flowers with those napkins also...they complement and contrast each other nicely. 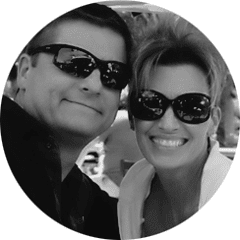 I'm so enjoying these blog hops and and it is a pleasure to be joining you also! Have a great one! Hugs! How gorgeous those cordial glasses are with the little eggs tucked into them! Layering the salad plates is a stand out on your table and that sweet bunny in the open lantern is a perfect centerpiece for your elegant table! Thank you dear friend for once again joining in another hop! Thank you so much Chloe! I found those at an antique flea market and fell in love with them. I use one to hold toothpicks. I could never figure out what else to do with them but when I got my eggs I thought they would work nicely together. I love that lantern and sweet bunny. Everyone, unfortunately, will be seeing that lantern around for a while...LOL I've thoroughly enjoyed it and thank you for giving me the opportunity to join you all! Hugs! You do clean and striking so well. Your table is beautiful. Love the flower against the soft striped napkins - that are folded so beautifully :) It is a pleasure to hop with you!! Have a wonderful Easter. Thank you so much Ann! I know it is different and that most people have more for their seasonal decor, but I'm enjoying the plainer, less decorated table this year. I've enjoyed these hops also! Happy Easter! Hugs! Your table is so fresh and clean and perfect for spring or Easter! I love your handsome lantern with your bunny as a centerpiece. Your napkin fold is one I DON'T know how to do. :) Fun hopping with you this week! Mary, thank you so much! I like the clean lines and will probably be sticking with it. I normally don't have my tables this sparse, but for the last two hops, it is working for me! Have a great one! Hugs! Very creative napkin fold. with the flower The open lantern looks great with the sweet bunny. Great find on the plates. Happy Easter. A pleasure to join you on this tablescape blog hop. Thank you Linda! I need to practice more folds...LOL I am in love with lantern...it may never leave my table. It may actually move to the bedroom table! :-) I've enjoyed it again also! Have a great one! Hugs! Thank you so much Carla! Awesome! I can’t wait to see it, hope you are doing a post! Love and hugs! Benita, you may only know one napkin fold - which, btw, is one I don't know how to do - but you do it perfectly! Not to mention that little daisy added in for contrast is perfect. I love your plate stack - brilliant to place the black underneath. And, I really love the height from the open lantern paired with that adorable bunny. Beautiful table! Thank you so much Kim, I appreciate it greatly! I fell in love with that lantern when I saw it and now it is a permanent fixture on the table! :-) Thank you again so much! Hugs! Benita, I love the simple elegance of your table. 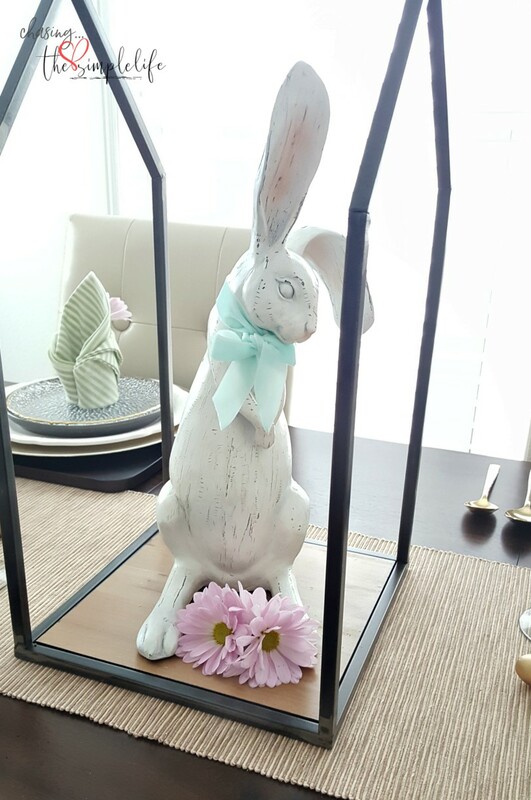 The open lantern with the bunny is the ideal centerpiece for your Easter theme. I love the gold accents on the plate rims, flatware and chocolate eggs. And the neutral runner is very chic! I wish I could practice some restraint on my tables...there's always a lot going on! Looking at your clean lines and elegant presentation makes me want to try. Have a blessed Easter with your family! Thank you so much! I love the lantern and will be using it from now on, or as much as I can. I just can’t seem to get away from the “less is more” on my table. I had a busy table at Christmas and now that I’ve changed it out, I am having a problem with going back. I hope you and your family have a wonderful Easter! Hugs!